Like a Modular Cleanroom, CMM rooms need to be temperature controlled. Often these rooms are located in an area of extreme temperatures, such as casting molds for molten metal. Using HVAC, filtration, and thermal equipment, Panel Built’s interfacing walls, floors, and mechanical components within the modular wall system will provide a containment-free environment, effectively allowing control of temperature and humidity. 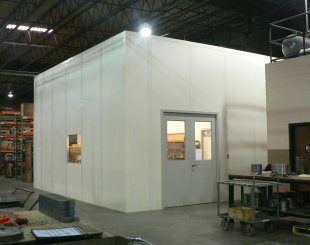 The CCM room will also be completely portable to customize your clean area. Dressing rooms can also be added to the CCM room to keep from contamination. Insulated window and door frames that create a solid and secure room. Prevent rust when exposed to moisture from high humidity or wash down condition. Serve as a wiring chase to conceal electrical, data, and communication system wiring.